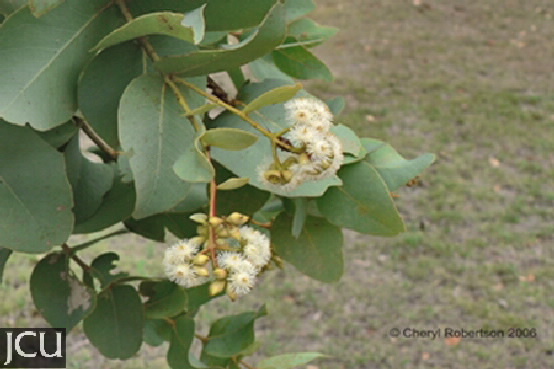 This tree is readily identified by the dark deeply furrowed bark and the bluish, ovate to broadly lanceolate leaves which are opposite one another and sessile on mature trees; from 5-9 cm long and 2-3 cm wide, leaf base rarely clasps the stem. The glaucous capsules, 3-8 mm long by 3-8 mm wide, have the valves exserted or level with the rim. There are no ridges on the side of the capsule. A confusing species is E. shirleyi, which has a ridge on the side of at least some capsules, also the leaves are larger and clasp the stem and the growth form is usually stunted.